Joani Peacock walks on a trail at Huntley Meadows Park in Alexandria, Va., Friday, Sept. 19, 2014. Peacock, who has bipolar disorder, walks regularly in the park, which she refers to as her "outdoor cathedral," to help maintain a balanced mood. Joani Peacock eats while watching television after returning from her daily walk, at her home in Alexandria, Va., Friday, Oct. 3, 2014. Peacock, who is bipolar, walks regularly and is training to walk a half marathon because she says regular exercise helps her feel more balanced. 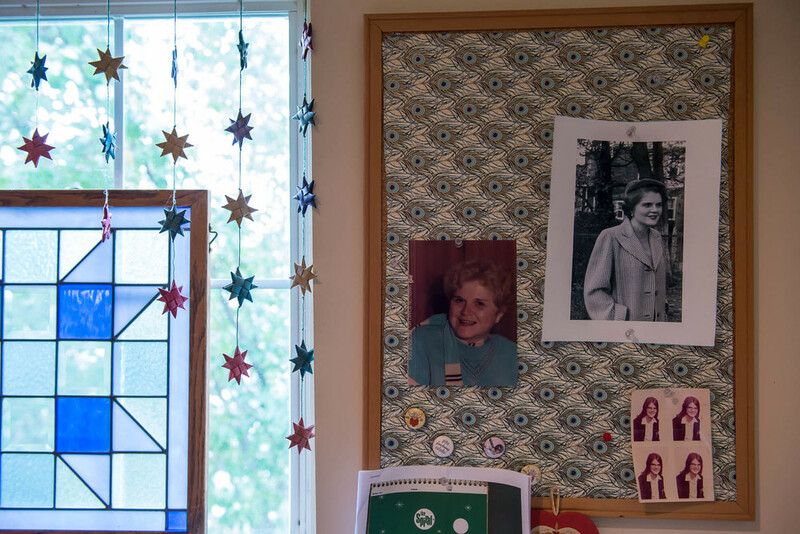 A bulletin board displays two photos of Joani Peacock’s mother, Mary Louise Cady Peacock (top left and right), and four wallet-sized photos of Joani Peacock taken in the early 1970s (bottom right), in Peacock’s Alexandria, Va., home Wednesday, Sept. 24, 2014. Peacock, like her mother, has been diagnosed with bipolar disorder, a brain disorder that is believed to be genetic and tends to run in families. 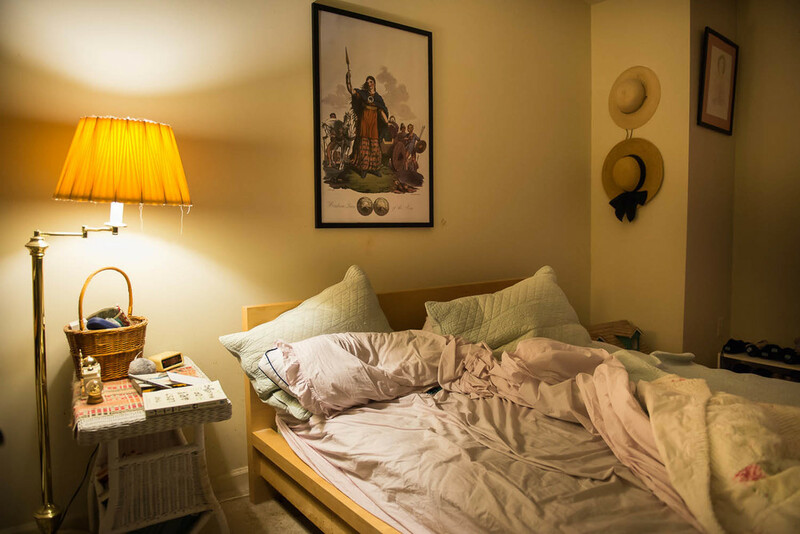 The bed sits unmade in the early morning hours in Joani Peacock’s bedroom at her Alexandria, Va., home, Saturday, Oct. 4, 2014. Peacock says that she strives to live a balanced life with bipolar disorder and surrounds herself with objects she has collected, including an image of Celtic war queen Boudicea that hangs over her bed. Joani Peacock takes a pill prescribed to treat her bipolar disorder at her home in Alexandria, Va., Friday, Oct. 3, 2014. Peacock, who was diagnosed with bipolar disorder 10 years ago, now takes three medications each evening before going to bed to help maintain balanced mood and energy. Episcopal priest Joani Peacock sits near the altar during a service she is leading at Emmanuel Episcopal Church in Alexandria, Va., Sunday, Sept. 28, 2014. Peacock, who has bipolar disorder, speaks publicly about her experience and recently led a discussion group about mental illness at the church. Joani Peacock speaks to the congregation at Emmanuel Episcopal Church in Alexandria, Va., where she serves part-time as a priest associate Sunday, Sept. 28, 2014. Peacock writes a blog called “Orthodox and Unhinged: Tales of a Manic Christian,” about her experience as a clergyperson with bipolar disorder. Joani Peacock sits quietly next to a photo of her mother Saturday, Oct. 4, 2014, in her Alexandria, Va., home. Peacock, like her mother who passed away earlier this year, has bipolar disorder and says her mother was diagnosed at a time when treatment for the brain disorder was difficult and less effective than it is today.